The Fort Lauderdale International Boat Show is one of the biggest superyacht industry events of the year. 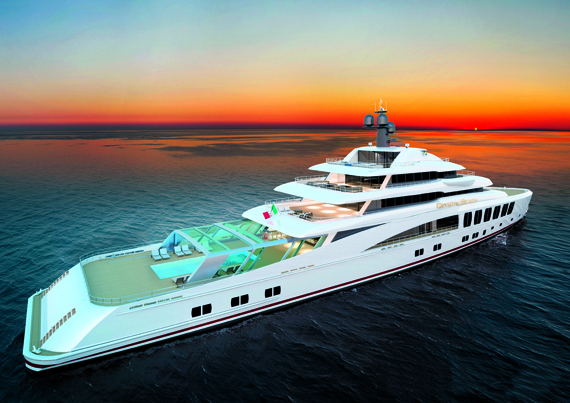 We’ve picked five of the best new superyacht concepts that made an appearance. With a dedicated owner’s deck and a generous crew-to-guest ratio, this is a yacht on which you will be spoiled. Floor-to-ceiling windows open up the accommodation suites (four guest cabins on the main deck), while the outdoor spaces are just as roomy. And all this from a yard schooled in the art of large yacht construction. Look out for the stunning ‘crystal beach’. A glass canopy that emerges on rails and encloses the pool to create the perfect place to swim, even in the dead of winter under leaden skies. LOA: 80.4m. Beam: 14.0m. Top speed: 18 knots. At 135 metres, Blue Seas has plenty of space for guests. She boasts a private owner’s deck with a 300-square-metre suite, an office and a five-metre-long pool. 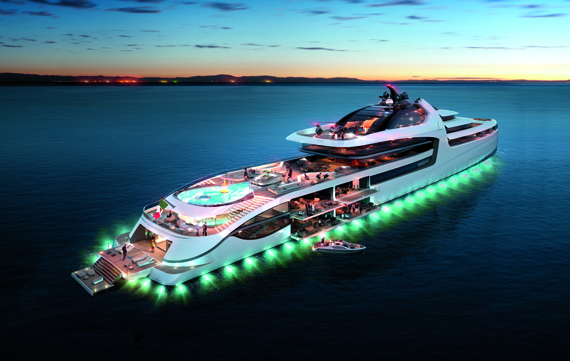 She also has a 14-metre-long pool on the main deck and two helicopter pads. A gigantic beach club opens onto the ocean for the ultimate alfresco experience. Dining capacity for 60 guests on the upper deck is the perfect follow up to a cocktail party in the observation bar. The spa is impressive – a sauna, massage parlour and beauty area ensure a relaxing cruise. LOA: 135m. Blohm+Voss has just announced its move into the semi-custom market with the BV80, a yacht that is built to be flexible: the aft space on the bridge deck can be used as a bar, gym, cinema or library. The large beach club is tender-free thanks to a garage in the bow. A spa, helipad, pool and Jacuzzi also feature. The huge owner’s suite has an optional firepit on the aft deck. 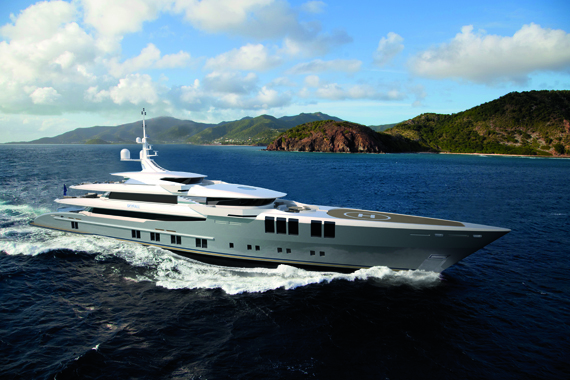 The yacht can also be built to include an extra staff cabin or nursery. LOA: 80.0m. Beam: 12.8m. Top speed: 17 knots. 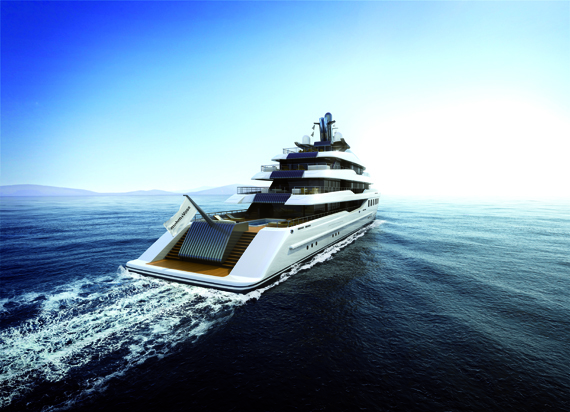 A staggering 145-metre concept based on an existing commercial platform, and packing in a fantastic array of guest amenities (there’s even a supercar tucked away on the sundeck, next to the helicopter). “It’s not a boat,” says the designer Sergei Dobroserdov. “It’s a world!” This is just one of a number of intriguing concepts being shown by the Italian Sea Group. The outside areas are plentiful, though if the over upper deck pool doesn’t grab you, there’s an enclosed one on the main deck below. Folding platforms open up the beach club area and the main deck to guests. LOA: 145m. A raft of technologies never combined on a yacht before will feature, including a Voith Linear jet-propulsion system and MME micro-turbine generators. The contemporary feel extends to the interior design by Focus Yacht Design and complements the sleek exterior lines. 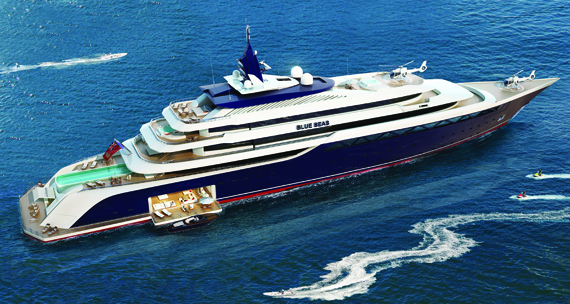 The yacht has been commissioned by experienced owners from North America, and is due to be launched in 2017. The deal was brokered by Worth Avenue Yachts. Look out for The enormous aft beach club with fold-out terraces, a gym and a huge swimming pool – the centre of attention if arriving by tender. LOA: 69.8m. Top speed: 27 knots.